Turns Mario / Luigi into Tanooki Mario / Tanooki Luigi. 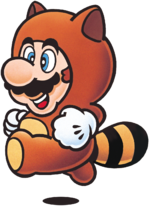 The Tanooki Suit is a fairly uncommon item found in Super Mario Bros. 3 and its subsequent remakes. It is based on tanukis, Japanese creatures who, according to mythology, can use leaves to shape-shift and cause chaos. According to Shigeru Miyamoto in the Super Mario Bros. 3 entry of the 25th Anniversary Super Mario History Booklet, he was aware that most players outside Japan would be overall confused with the Tanooki Suit and the transformation, but he left it in anyways because it was cool and he was too excited to remove it. First found in World 4, the suit transforms Mario or Luigi into Tanooki Mario or Tanooki Luigi, respectively. The suit grants the same abilities as the Super Leaf, with the added ability of turning into a statue when the player holds and presses at the same time. This briefly lets Mario hide from enemies and hazards, or stomp even more of them than he can normally if he transforms above them. Mario retains the P-Wing's infinite flight if he grabs a Tanooki Suit while using one. Also, Super Mario Advance 4 adds new utilities to this suit: its Statue form can reveal Vanishing Blocks and break Gray Brick Blocks. While Tanooki Mario returns in Super Mario 3D Land, the Raccoon form and Tanooki Suit do not. Instead, Super and Statue Leaves turn Mario into Tanooki Mario, though he cannot fly; the latter Leaf mimics the function of the Tanooki Suit, as it grants the Super Leaf's abilities and the Statue ability (via ground pounding), but it is only available in the Special Worlds. In Super Mario 3D World, despite Tanooki Mario's return, the Statue form and Statue Leaf are absent. The Lucky Bell debuts in its place, acting as the Tanooki Suit/Statue Leaf compared to the also newly-introduced Super Bell, as it lets Mario become a lucky cat statue in addition to the latter Bell's abilities. While the Tanooki Suit doesn't appear in Paper Mario: Color Splash, a Shy Guy mentions it by saying: "It looks like your upper lip found a Tanooki Suit!" The Tanooki Suit was prominently featured in a Nintendo Comics System story titled "Tanooki Suits Me"; according to this story, the suit was one of many magical suits made by a tailor named Tanooki whose trademark was to sew a tail on the back of each one. It is revealed in this comic that Mario turns into a statue by pressing a button on the front of the suit, and changes back by wishing to return to human form. After the release of Super Mario 3D Land, PETA made a website and game to promote their anti-fur campaign ("Mario Kills Tanooki") with regard to the live skinning of raccoon dogs or tanukis. The site implied that Super Mario 3D Land was promoting the use of animal furs as clothing. This resulted in strong backlash from Nintendo and their fans. A spokesperson from PETA later claimed their allegations were "tongue-in-cheek" and "a fun way to call attention to a serious issue, that raccoon dogs are skinned alive for their fur." This campaign received a lot of negative comments. PETA even went so far as to create their own Mario-based browser game entitled "Super Tanooki Skin 2D". The game stars the character of Tanooki, a skinless animal who is chasing Mario to get his skin back. The game has the player dodge obstacles in order to catch up to the famous plumber, who is flying ahead of Tanooki, wearing his skin which is dripping with blood. When the player wins the game, a message pops up that reads, "! @#$ you Mario! The skin belongs to an animal!" In Super Mario Bros. 3, if Mario or Luigi defeats a Koopaling while wearing a Tanooki Suit, the restored king will say, "Thank you, kind raccoon. Please tell me your name." In Nintendo Monopoly, there is a Coin Block/Brick Block card that charges the player $50 for a new suit. The artwork depicts Mario wearing a Tanooki Suit. In Super Paper Mario, Francis wants a Tanooki Suit that is made out of real Tanooki fur. In the Super Mario Mash-Up Pack in Minecraft, Chain Armor is replaced by the Tanooki Suit. The Teeth of Tanooki weapon in Mario + Rabbids Kingdom Battle is modeled after the Tanooki Suit. ↑ Super Mario History Booklet, page 13. Shigeru Miyamoto: The Tanooki Suit turns into a statue! Even though I knew it wouldn't make sense to some non-Japanese players...I was so excited about it that I left it in. This page was last edited on February 28, 2019, at 18:08.